Your dream of Bali may not be as dreamy as you imagined it when you arrive on the island to find that it has been attacked by tourism and jangled by traffic congestion. My friends told me how idyllic Bali was in the ‘70s, ‘80s and even in the early ‘90s. Well, here I was, lounging in a palm-fringed beach resort (not so bad) and longing to find the old soul of Bali. I had a hunch that the authentic culture and tropical beauty of the island lay somewhere beyond the tourist traps of Kuta and the shopping malls of Denpasar, so with the advice of the hotel concierge, I hired a guide and resolved to find the best Bali daytrips, far from the madding crowd. I recommend hiring a car and an English-speaking driver/guide to avoid the stress of dealing with motorbikes, trucks and tour vans, the exhaustion of driving on the left, and wasted time of figuring out where to go. My fav driver/guide is Nugroho “Budi” Sukiswo, who is available through Happy Trails or Destination Asia. Expect to pay about $50 for 8 hours. Bring along plenty of water, a bathing suit for impromptu, refreshing dips; plus a hat, and a sarong (guys too) for covering your shoulders and legs in temples (also, you’ll need to leave your shoes outside of some temples, so wear or bring flip-flops). First thing in the mornings, head out of Denpasar into the cool, green highlands, and, plan to get back to your beachy haven before the crush of late afternoon traffic. My daily expeditions led to mountain villages, spectacular Hindu temples, and having cultural attractions to myself, as I arrived before the tour buses. Everywhere along your route, you’ll pass elaborate stone temples, where women, often in traditional costume, place baskets of flowers and fruit every day. You’ll also see these offerings on the sidewalks and entrances to shops and businesses––try not to step on them! Every house, village, public facility and plaza has its own Hindu temples––usually in groups of three, dedicated to Vishnu, Brahma, and Shiva. At about 4,000 feet in elevation on the edge of Lake Beratan, the classic Hindu/Buddhist Ulun Danu Beratan Temple was built in the 1660s in honor of Dewi Danu, the goddess of water. The air is cool and the temple is dramatically photogenic in the misty mornings, before tourists and locals arrive in force. You can wade in the shallows here and jump in for a swim; along the road above the temple are a gang of tacky souvenir stands. 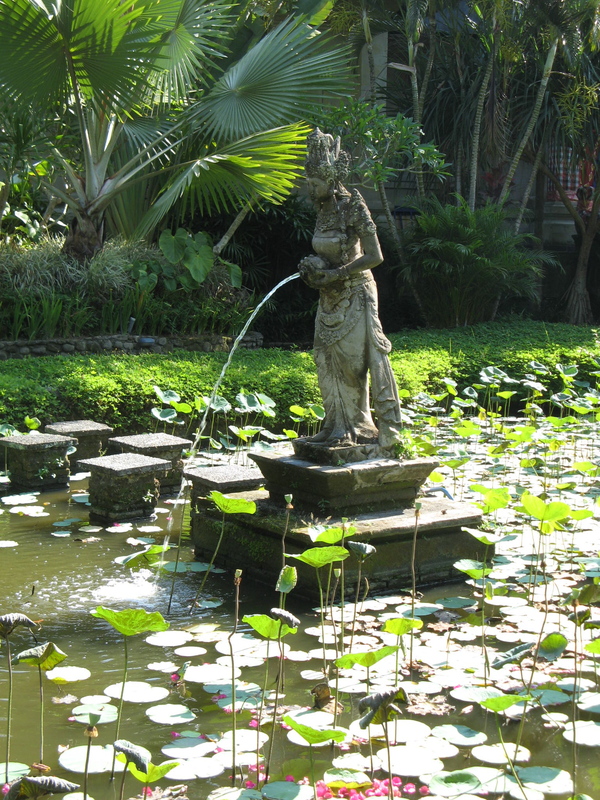 In the jungly forest above the lake, Eka Karya Botanical Gardens is a magical realm of cascading orchids, huge shade trees, ferns, medicinal and aquatic plants, and thousands more species, plus a couple of temples and statuary, and lake views. Nearby, the (quite good) restaurant at Bali Handara Resort and Golf Club has great views of the surrounding mountains and the lake. One of the top rated courses in Southeast Asia, the golf course is awash in tropical vegetation. A great place for lunch or dinner while in the cool, green highlands above Lake Beratan is Puri Candikuning, a hidden gem of a luxury resort, once the weekend retreat of one of the wealthiest families in Indonesia. Today, guests recline in their lounge chairs beside the swimming pool overlooking the vast lake. From here you can see Mount Batur above the rim of the volcanic caldera surrounding the lake, and the famous Ulun Danu Beratan Temple, far below. For their guests, the resort will arrange transport down to the lake for a boat ride, and to the nearby Eka Karya Botanic Garden. As a luncheon or dinner guest, you can take a peek at the library lounge and the karaoke room. Spacious, beautifully furnished and decorated villa suites each have kitchens, and some have lush private gardens and Jacuzzis. Room rates are surprisingly affordable. Even if you are not staying at Puri Candikuning, do stop in for some of the best food on the island for lunch or dinner; call ahead to be sure they are open. In the evenings, lanterns and the fireplace glow as the sun sets and the moon rises over the lake. Arrive early at Penglipuran Village, a large complex of traditional houses, temples and gardens; tourists and tours will be right behind you! You are welcome to wander around. Do accept an invitation from a householder to visit their home, where you may be offered a few trinkets and crafts. I followed a woman into her garden to admire her temples and her pigs and chickens, and purchased from her my all-time favorite sarong, at a very fair price. Get an idea of traditional Balinese architecture, ethnic groups and the history of Indonesia all in one place, Taman Nusa Cultural Park. Above the Melangit River in a sprawling tropical setting, you’ll see temples; dozens of houses with soaring thatched roofs and vivid decoration; statuary, museums, and authentic art and crafts, along with dance performers, artists and craftspeople. When your feet wear out, relax and enjoy the treetop view from the restaurant, which serves very good food. If you take care to avoid weekends and holidays, and call ahead to ask if large groups are expected, you may be wandering around here nearly alone. Taman Ayun: lovely gardens, lotus ponds and royal temples in a park-like place shaded with Jacaranda and plumeria trees. Surrounded by lotus-bedecked moat, elaborate temples were erected in the 1600s by the king of the Mengwi Kingdom, and restored in the 1930s. Beat the tour buses by arriving soon after the 8 a.m. opening. Jatiluwih Valley: some 500 years old, rice terraces are undulating waves of green against a backdrop of towering volcanoes––as far as the eye can see, a very photogenic vista, especially at sunrise and sunset, when the colors of the sky are reflected in the silvery water. Pakerisan Valley: the 11th century temple complex of Gunung Kawi in a river valley of rice paddies. In the village of Tampaksiring, ask to be directed to the trail down to the river valley to the monuments and water temples. A guide knowledgeable about the history and meaning of the archeological sites will greatly enhance your experience here. In the foothills of Mount Agung, which peaks out from the clouds, the village of Sideman is a sort of Shangri-la, surrounded by rice terraces and plant nurseries, and famous for hand-loomed textiles––bright-colored ikat-tied Endek cloth that you’ll see made into table linens and vivid clothing worn for religious and formal occasions; and Songket fabric, threaded with gold and silver. Workshops are lined up on the main street and around the area; be sure to ask directions to Pelangi Weaving. If you fall in love with Sideman, stay on for a day or two at one of the several small inns, and explore the highlands on walking and biking trails. Not far from here in the village of Besakih, the “mother temple” Pura Besakih is the largest temple complex on Bali, and one of the most popular tourist attractions in the country. Nearly two dozen temples and various courtyards are impressively stacked up on the steep mountainside; to be admitted, visitors must wear sarongs and have shoulders covered, and bring flower offerings, (your hotel can provide you with them). Many festivals and ceremonies are held here during the year––avoid them at all costs unless you want to drown in humanity and traffic. You will be accosted by so-called guides and other rascals who will attempt––unceasingly––to rip you off. My advice: as photogenic as this place may be, skip it. 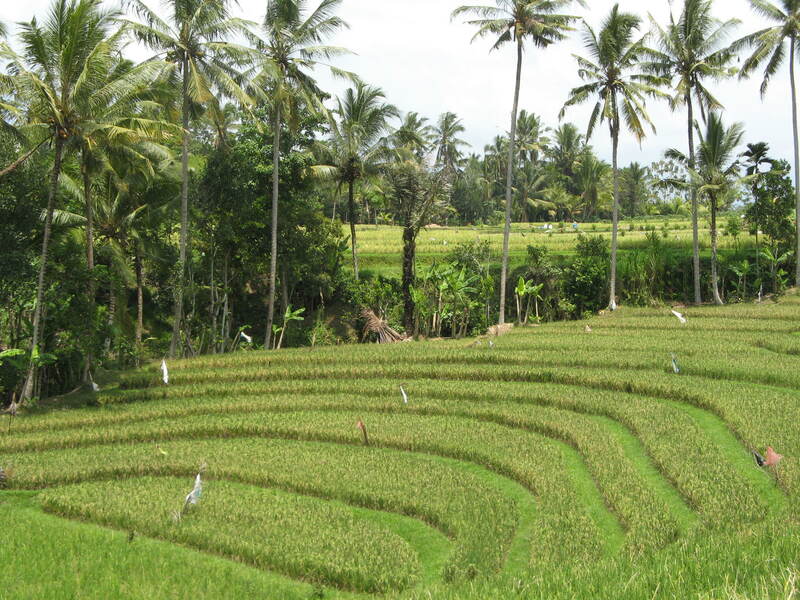 The cultural and art capitol of Bali, Ubud is a must. A good place to start is Indus restaurant, for fabulous food in a lovely, breezy aerie above the Tjampuhan River. If you’re lucky you’ll meet one of the proprietors, Ketut Suardana or Janet DeNeffe, a married couple full of stories about the history of the art colony. They own three top restaurants in Ubud, the Casa Luna Guesthouses, and a cooking school. Janet is famous for her expertise with Balinese cuisine, and she hosts the Ubud Food Festival. 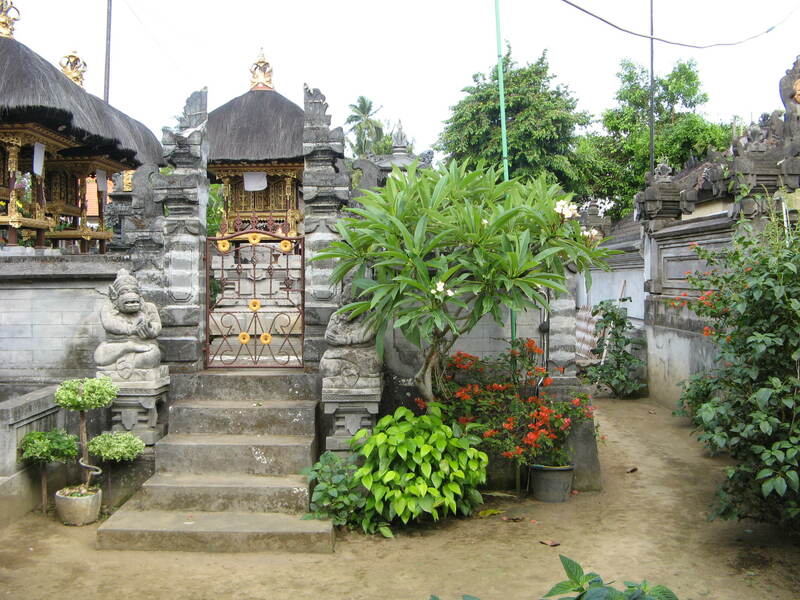 The couple also founded the annual Ubud Writers and Readers Festival here, which attracts thousands. You’ll be tempted to linger at Indus at a table or on the Balinese style lounges, for gorgeously presented pan-Asian cuisine––some of the best restaurant food on the island. Here are some fab photos of my group’s lunch at Indus, as taken by Carole Terwilliger Meyers, one of my travel mates. The tourist boom in Ubud began in the 1930s, when the king of Indonesia, Tjokorda Gde Agung Sukawati, and his royal entourage and prominent artists and celebs, began to gather here. American and European hippies followed in the 1960s, and battalions of art lovers in 1980s. Sharing my sentiments about Bali’s over-touristed world, Don George, one of the globe’s best-known travel journalists, discovers hidden beauty in Ubud in his essay on National Geographic’s Intelligent Travel site. 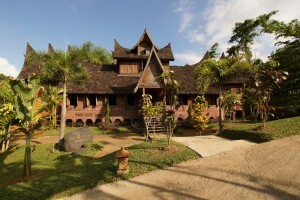 As a result of the king’s interest in art and his support of the burgeoning art colony in Ubud, an extensive museum complex was built on the outskirts of the village. 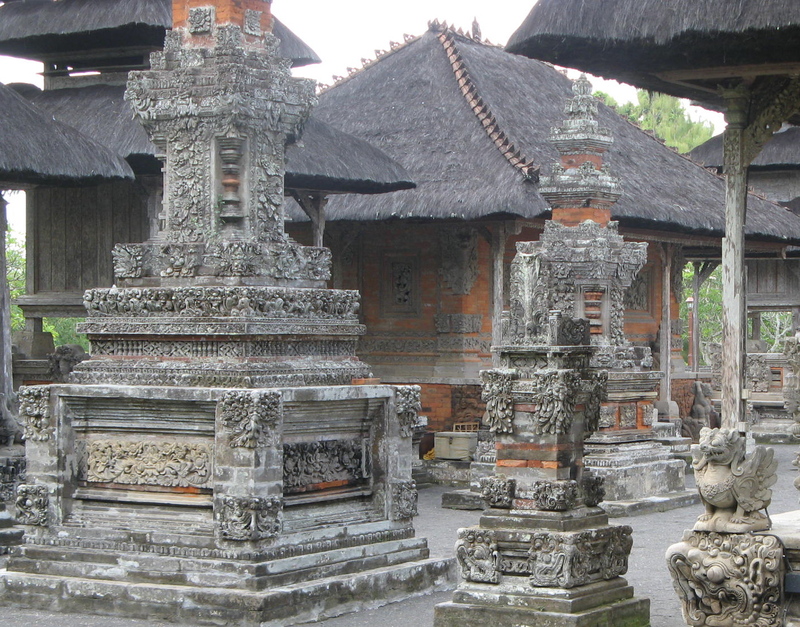 Puri Lukisan Museum today comprises three beautiful buildings exhibiting traditional Balinese-style paintings, wood carvings and other art works. On hot days, it’s delightful to linger here beneath the palms by the lotus pond. If you get roped into going to a touristy Barong lion dance show in Batubulon, tell your driver to take you instead to Pura Puseh, an 11th century temple complex nearby. 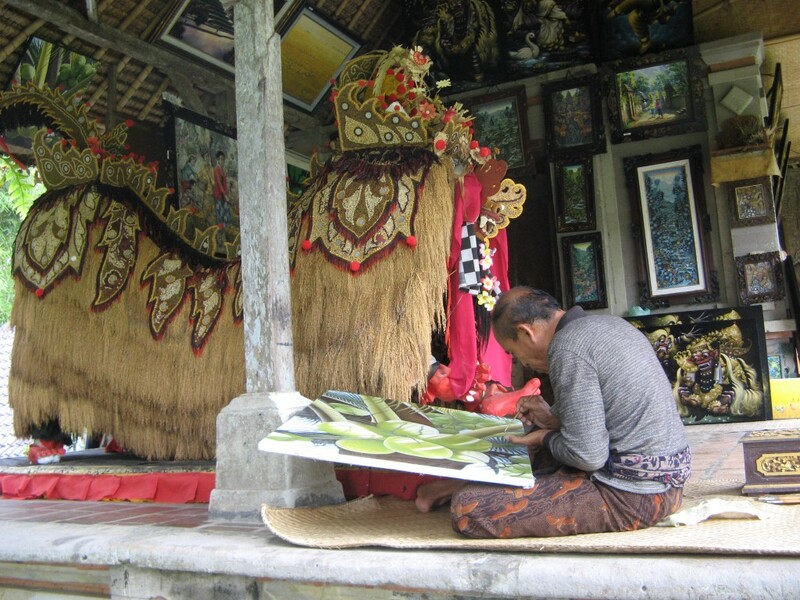 Here in the artist’s village of Batuan, you’ll also encounter textile and woodcarving workshops, and shops selling Balinese-style paintings. Every evening, crowds flock to watch the sun set over the sea at Tanah Lot Temple, a short drive from Denpasar. You will share a dry, dusty tourist trap, junky souvenir shops, and cafes with jostling, elbowing, noisy holiday-makers. To see the seaside temple in relative solitude, get here––once again––early in the morning. 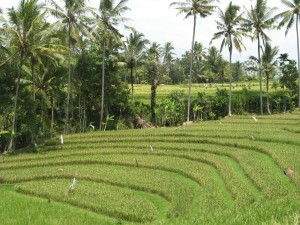 Click here for Part II of Best Bali Daytrips. A sidetrip to Flores Island is a worthy adventure––for the dragons, the crystalline waters of the archipelago, the wonderful weavers, and an enchanted village. Swiss-Belresort Watu Jimbar a 330+ room hotel in the Sanur beach, shopping and hotel district, with a spectacular, palm-fringed pool terrace and inviting pool bar. The on-site tour company and concierges make it easy to use this as your Denpasar headquarters. Vasanti Seminyak Resort Bali in Denpasar on a quiet street lined with small hotels and inns, a new and very pleasant hotel with an inviting, vine-draped pool terrace with a pool bar, a full-service spa, and a rooftop bar. A sumptuous breakfast is complimentary, as is a shuttle to downtown shopping and to a beach club. Hotel Peneeda View Beachfront in the Sanur beach district. Affordable waterfront garden hotel with 3 swimming pools and a restaurant (ask for a room away far from the live music). In the Nusa Dua luxury resort district, if your deep pockets allow, choose from Amanusa, the St. Regis, the Westin or The Laguna. The Four Seasons Resorts Bali offers guests two idyllic 5-star resorts: the oceanfront 4 Seasons at Jimbaran Bay, and the riverside retreat at the 4 Seasons at Sayan (in Ubud). 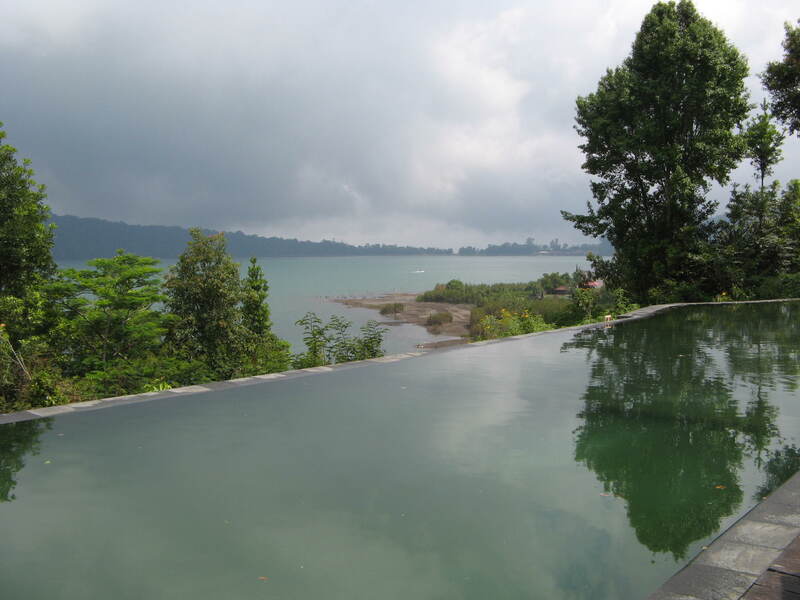 Complete with a plunge pool at each guest villa, Jimbaran Bay has recently been renovated. At Sayan, stop in to experience this unique property, which floats in heavenly rice fields, palms, gardens and banyan trees, and stay for a romantic al fresco lunch or dinner at the Riverside or Ayung Terrace restaurants. From The Guardian: “People say that Bali is spoiled and for years the search has been on for a “new Bali.” But the old Bali never really disappeared, it just went west.” More here on getting away from the madding crowd!